You do not need an account to order! Please Size file to desired output plus 1/8 inch bleed. Aluminum Prints can be ordered in any size from 4×4 to 43×96 inches. *If you do not see your desired size in the dropdown on the order page, please call to order. White High Gloss – Brilliant high gloss surface that shows every detail. Excellent surface for any subject matter especially nature, water, cars and so on. Maximum wow factor. White Satin – Smooth, very even and soft appearance. Great for portraits, weddings and if surface reflection is a concern. Sheer – Allows the surface of the metal to show through giving the image a translucent luminescence. This unique material works well with high key images and images with subtle color transitions. Available with a Glossy or Matte finish. Float Mount Hangers – Our Float Mount Hanger is attached to the back of the print, and floats the print 1/2-inch off the wall when hung. 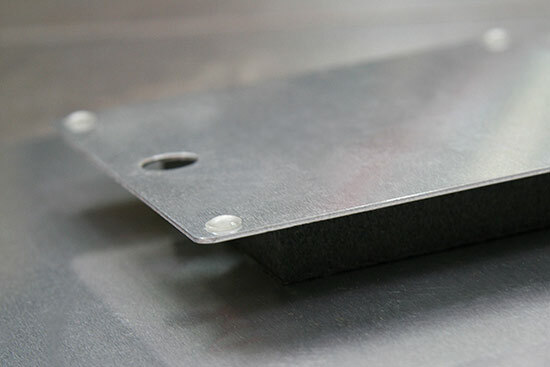 Corner Options – Choose from Rounded Corners (1/8-inch or 3/16-inch) or Scalloped Corners. 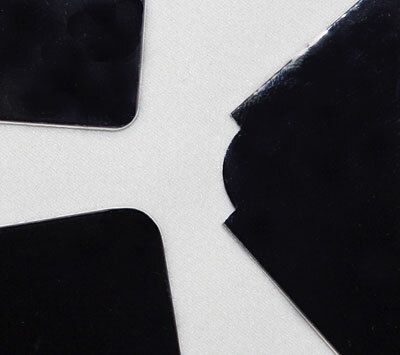 Sharp Square Corners, which are the default corner option, can be quite sharp and should be handled with care. Drilling Corners: Top 2 or all 4 corners pre-drilled for your own hardware. Stainless Steel Mounting Posts – Stainless Steel Posts come in a set of four pieces, one for each corner. 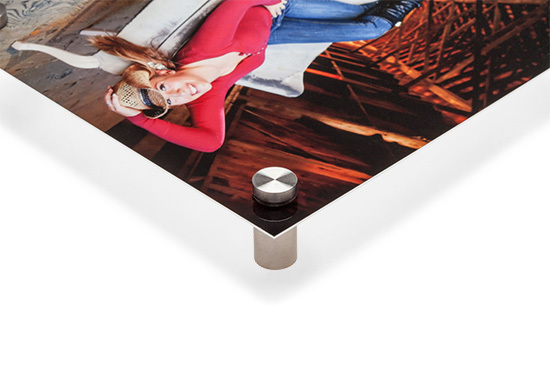 Available in small and large sizes, these posts are the newest Aluminum Print mounting option available. How Archival are Aluminum Prints: While photo papers have fantastic image stability, Xenon Light Stability Testing results show that the image stability of Aluminum Prints (aka Metal Prints) is 2 to 4 times the image stability of traditional silver based photo papers. Images printed with the Aluminum Printing (aka Metal Printing) process will last for generations when displayed indoors and out of direct sunlight. 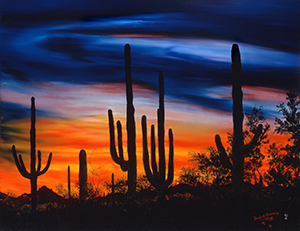 Like any fine art print, Aluminum Prints should not be exposed to direct sunlight or high outdoor temperatures. Aluminum Prints have an additional benefit over gicleé or photographic processes in that they are waterproof and have an ultra-hard scratch resistant coating. The archival value of a print should be judged not only by its resistance to degradation by U.V. light and ozone exposure, but also to moisture and surface damage. When these factors are brought into the equation, Aluminum Prints are an excellent way to preserve an image. Standard Turnaround Times: Free Shipping on all sizes up to 40 inches (one dimension). Sizes 40 inches (one dimension) and larger have to be crated. Please call for shipping rates on orders that need to be crated. 2-3 days is our standard turnaround time. We pride ourselves on quality, consistency and fast delivery. Occasionally, there may be factors (special requests, unclear instructions, production problems etc.) that might cause an order to be delayed. We rarely miss our delivery times, however they are not guaranteed and do not include Holidays or transit times. Rush service is available, lab schedules permitting. Call for rush prices 928-300-3934 These turnaround times are approximates and are not guaranteed.